The Bonneville Power Administration will rein in the wind, and is likely to reap the legal whirlwind. In a decision that speaks to the region's ability -- or inability -- to effectively manage all the simultaneous wind and water energy being generated in the Columbia Gorge, the Bonneville Power Administration said Friday it will pull the plug on wind farms at times when excess generation threatens to swamp the system's ability to handle it. That could come early next week, as spring runoff increases hydroelectric generation, the agency said. BPA's decision is almost certain to trigger litigation from wind farm operators, including independent producers and utilities -- whose projects won't generate expected financial returns. They depend on turbines running flat out when the wind blows to generate not only power, but the renewable energy and tax credits that make up a sizeable slice of their revenue stream. Wind operators say BPA's plan, which would unilaterally override their transmission contracts, is discriminatory and designed to protect the agency's surplus power sales revenue. That revenue goes to lower the rates of the 140 public utilities who buy their power from the federal agency. "This is a very loud and unmistakable signal to the wind industry that this might not be the place to do business," said Robert Kahn, executive director of the Northwest & Intermountain Power Producers Coalition. "This was predictable and preventable. We should never be in a position of having too much of a good thing." BPA sells power from 31 hydroelectric dams in the region and operates much of its transmission network. The agency's administrator, Steve Wright, has been pressured by members of Congress to back away from the plan. He acknowledged Friday that BPA could quickly face litigation, but said he had little choice. "We wouldn't do this if we didn't have a good chance of winning, so we're ready if folks choose to sue, he said. "What I regret is that we haven't found a better solution." BPA finalized the policy to prepare for what could be the highest runoff in the Columbia Basin since 1999. That could boost power production from its own dams beyond limited spring electricity demands. The agency is also responsible for integrating generation from wind farms connected to its grid, toggling its own production up and down to match power demand and supply and keep the grid humming along in balance. Under the terms of the plan, the agency will respond to overgeneration by first curtailing as much coal and natural gas generation as possible, then pull the plug on windfarms. BPA will substitute free hydropower to make up the energy deliveries that the wind farms are otherwise scheduled to make. The agency contends it can't turn off its own hydroelectric turbines and spill more water to accommodate wind because the resulting turbulence would violate limits on dissolved nitrogen in the water, harming fish. That leaves wind curtailment as the only choice. BPA is aware that wind farms don't want free hydropower because power buyers are also after renewable energy credits. Utilities use the RECs to comply with state renewable energy mandates, and they're generated only when the turbine blades are spinning. RECs and federal production tax credits can make up 50 percent of the revenue stream for a wind farm. 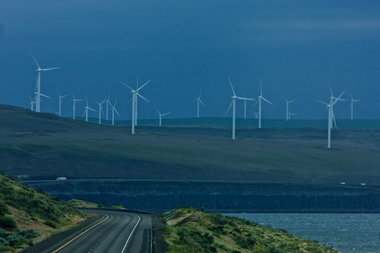 "We feel there are other options," said Roby Roberts, vice president at Horizon Wind Energy, which operates three wind farms in Oregon and one in Washington. "We're going to push for a different resolution." BPA has worked on a variety if interim solutions to accommodate more wind, but crtitics say it's been too little too late. Wright said Friday that most of those measures were stopgaps. What the region needs, he said, is more physical assets, either new transmission or storage of some form, both of which are expensive, longer-term solutions. "We'll have to explore all these things," he said. "The other thing that's clear is that there's a lot of wind still coming on the system and the problem keeps getting bigger."